#Office365Challenge What a great idea! Help-me-draw (straight). Because let’s face it, we’re not all Pablo Picassos, or wait, maybe we are. We’re not all architects – and what I’m referring to is drawing straight lines and shapes. 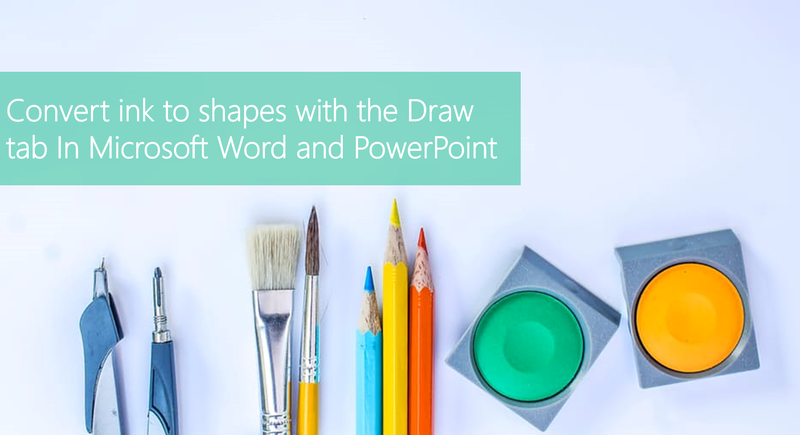 This post will share the new “Ink to Shapes” functionality in Office 2016. This update came through in October 2016. Applicable to Office 2016 (reliant on your release preferences on Office 365). If you don’t see this in your Office 2016 – chat to your Admin / IT department. In Word, PowerPoint and Excel you can draw (pen or touch) and then convert the ink drawings to shapes. Keep in mind, in the video clip you’ll see I selected “Draw with Touch”, this does not work in Excel where you only select “Ink to Shape”. Click on the Draw Tab, then on Ink to Shape. You have to ‘activate this first for it to work. I’ve done a very short video clip (50 sec) for you to demonstrate how easy it is. Simply draw a shape, and it will convert on its own. (Have to admit – I’m not that good at the circles – it’s gonna take some practice 🙂 ). I used my Surface pen on screen, and also tested it with my fingers in Excel.